The Dell Latitude 12 Rugged Extreme, the first rugged laptop-tablet hybrid, was built to withstand all sorts of environmental hazards, and it shows. The rugged computing space is one met with little competition. Panasonic has long been the known commodity when it comes to field-ready laptops and tablets. But Dell looks to keep its rivals on their toes with "the industry's first rugged convertible laptop," the Dell Latitude 12 Rugged Extreme. 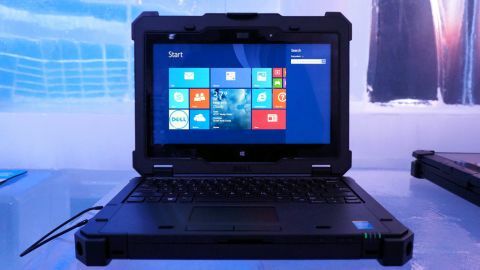 This bulging behemoth of a laptop-tablet hybrid is designed for use in several high-impact fields, namely police work, emergency response and in the military. That's why Dell made sure that this Latitude meets several military specifications for field use – MIL-STD-810G, IEC 60529 (IP-65), MIL-STD-461F, and ANSI/ISA.12.12.01, if you're keeping score. In other words, this laptop is extremely resistant to water, dust, cold, heat – thanks to its isolated "QuadCool" cooling system – and more. Dell claims that the Latitude 12 can withstand repeated drops from as high as 6 feet. And speaking of water resistance, I poured an entire bottle of water on its bigger brother, the Dell Latitude 14 Rugged Extreme, and it continued to press on. Both devices have drainage ducts to thank for that. But Dell is also concerned with providing rugged laptops that are just as tough on the inside. So, the Latitude 12 Rugged Extreme can be equipped with one of Intel's 4th generation CPUs and optional discrete graphics. You can also spec a ruggedized Latitude 12 with up to 16GB of RAM and 512GB of solid-state storage. On the outside, the Latitude 12 comes sporting Dell's "RGB" backlit keyboard, which features several color options, namely those visible from behind nightvision goggles. The machine's HD webcam comes with a privacy shutter, for security reasons, and is joined by an 8-MP shooter (with flash) around back. All of this comes wrapped in a magnesium alloy frame bolstered by ultra-polymer plastic and sealed doors around its ports (including USB 3.0 and native serial connections). Naturally, all of this hardware together doesn't come cheap – $3,649 (about £2,194, starting from AU$4,999), to be exact. One of the first questions I had for a Dell representative at the event was, "How does the touchscreen work under wet conditions?" To ensure that rain and snow would be of no concern for folks on the field, Dell packed the Latitude 12 with a resistive touchscreen. "Resistive" means that the panel relies on pressure to detect your touch rather than electrostatic conduction from your bare fingers. This means that the screen works with gloves, and to great effect, as I was able to test the panel with covered hands in an (admittedly freezing) ice bar recently. However, I also noticed that the Windows 8 Modern UI blurred significantly as I swiped back and forth. I'm told that this may have been a bug, and the unsightly blur will not be in sight upon release. That said, colors popped on the display, which Dell dubs a "Direct-View" panel with increased outdoor readability, since it relies less on backlighting. Dell says this helps the Latitude 12 claim 8 hours and 30 minutes of battery life. Perhaps too hard of a hybrid? If you're wondering how Dell got a hybrid device to work while still meeting rugged specifications, the answer is the XPS line, believe it or not. Dell used the same swivel hinge technology found in its premium leisure laptops, but upped the rigidity to match the desired mil-spec certifications. But perhaps Dell went a bit too firm: switching between tablet and laptop modes was tough to manage one-handed, not to mention opening the clamshell lid in the first place. This isn't a swap you're going to make on the fly. And good luck holding the device in one hand and using the touchscreen with the other. But maybe that's the point: This looks like a laptop that you'll have to try to break. And that's what you should want from something you're spending tens if not hundreds of thousands of dollars on for your squad. The Dell Latitude 12 Rugged Extreme is an impressive machine, demonstrably ready to take a beating … and a splashing … and a dusting. Plus, this new model's docking mechanisms are compatible with all previous Rugged Extreme docks, making deployment simpler and more affordable. But given issues like the intense blur when using the resistive touchscreen, it looks like Dell still has a bit of work to do before this ruggedized hybrid is ready to hit the battlefield. By May 6, when this squad-ready laptop-tablet hybrid will launch, my bigger concern would be whether the Latitude 12's weighty tablet mode will work for users in the heat of the moment. As a notebook, however, this Latitude looks prepared for a pummeling.